The Washington Post editorial clucking its tongue at Democratic attacks on the GOP Medicare plan is a useful encapsulation of the vacuity of the conventional wisdom on this subject. It's worth paying some attention to the editorial, because it takes at least a half step toward making explicit the assumptions that undergird most of the coverage of this issue. Democrats have effectively scared seniors as a political tactic for many years. Republicans turned the tables in 2010, using the Medicare scare tactic against Democrats. Now Rep. Paul Ryan (R-Wis.) has given President Obama and his party a chance to reclaim the low ground, and they haven’t hesitated. Mr. Ryan’s budget, which the House passed, is wanting in many ways, as we’ve noted. It would expand the nation’s debt because it doesn’t acknowledge the need for more revenue. It contains far too much risk of harming the most vulnerable. But it’s honest enough to acknowledge that simply preserving Medicare as we know it is not an option. The ubiquitous term "scare" is perpetually attached to any description of opposition to reductions in Social Security or Medicare, but is rarely used to describe opposition to other policy changes. If you're warning against a proposal to raise taxes or cut defense spending or increase the minimum wage or legalize gay marriage, you are not trying to scare people. You are only scaring people if you're opposing a reduction in Medicare or Social Security. The unstated assumption is that it is not possible to argue against any such proposal in rational or moral terms. It is only possible to make arguments that 1) mislead, and 2) appeal entirely to self-interest (you're going to lose you're Medicare, as opposed to, the principle of universal medical insurance for the elderly is being threatened). This is a deeply enshrined premise of Beltway wisdom. 3. Ryan's plan must be done. Now, the Post doesn't say that Ryan's plan must be done. it acknowledges some flaws. Yet in nonetheless deems opposition unacceptable. He is doing something! The need to do something is deemed so overwhelmingly vital that it's immoral to criticize any plan that does something, however harmful or poorly designed that something may be. 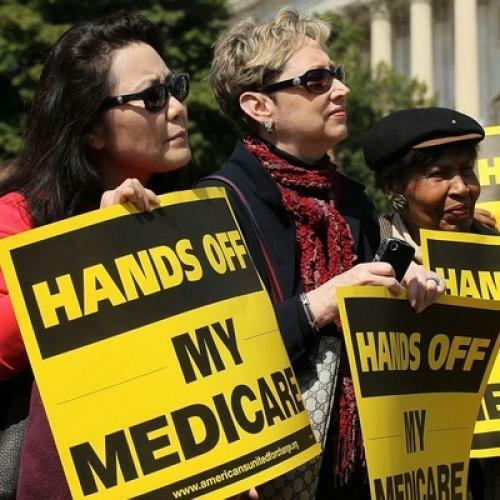 The editorial argues that "simply preserving Medicare as we know it is not an option." Of course it's an option. We could raise taxes to the levels that other advanced democracies employ. We could cut Medicare in some way that doesn't both waste money on privatization and dwindle to grossly inadequate funding levels. Indeed, several bipartisan proposals, including the sainted Bowles-Simpson plan, do exactly that. This is false, inflammatory and, as we said, useful — for winning elections, that is. When it comes to solving the government’s most pressing problem, it threatens to set things back. Are these claims false? No, they aren't. Let's take the democratic claims in reverse order. The current Medicare system is a commitment to cover health acre expenses for the elderly. The Republican plan would end that commitment and replace it with a limited and rapidly shrinking subsidy toward that end. It's somewhat tantamount to replacing public education with a system of limited vouchers for well below the average cost of public school tuition. Would you describe that as "killing" public education? I would -- the design of the program would be so altered as to no longer constitute the same thing. Now, one could argue that Ryan's program preserves enough of the same elements -- it still helps pay for health care for the elderly -- that it should be considered the same thing. But this is a highly contestable interpretation, and disagreeing with it is hardly "false." Indeed, the description of ending Medicare seems like the most persuasive description of the deeply radical changes proposed. “If you run out of the government voucher and then you run out of your own money, you’re left to scrape together charity care, go without care, die sooner. This not only seems to be defensible, but obviously true. I don't see how a plan to replace Medicare with private insurance vouchers that will eventually cover just a small fraction of the cost of private insurance could have any other result than the one Sebelius describes. It's true that Ryan insists that the magic of the market will cause health insurance inflation to suddenly cease, and thus prevent the sorts of hardship Sebelius describes. But failing to accept that wildly optimistic scenario is hardly the same thing as lying. Indeed, the Post doesn't even endorse Ryan's argument, so it's not clear what part of this claim it deems untrue. When you put together the two parts of the Post's editorial, the logical train seems clear enough. Since cutting Medicare is necessary, the Post reasons, any attempt to describe harmful consequences of any proposal to cut Medicare is inherently false. The CBO estimates that spending on premiums and out-of-pocket costs for a typical Medicare beneficiary would increase from approximately 25 percent under current law to as much as 68 percent by 2030. With a stage II breast cancer case costing an estimated$111,000 over a year and a half and a stage III colorectal cancer caseestimated to cost more than $250,000 over more than two years, shifting the bulk of the cost to seniors who are often on a fixed income could force them to make a tough choice between saving their life or their life savings. In addition to premium costs, Medicare beneficiaries with cancer face an incredible burden in paying for lifesaving cancer medications. The Affordable Care Act [President Obama’s health-care law] took significant steps toward reducing this financial burden by phasing out the Part D coverage gap, which requires beneficiaries to pay the full cost of their medications until they reach a certain out-of-pocket maximum. The House budget proposal would repeal these subsidies by requiring that cancer patients and others with chronic illness continue to pay more for the cost of their medications. Certainly, serious questions have been raised about what the proposed changes would mean for people facing suddenly high health costs. But the budget debate in Washington is fierce enough that senior officials should avoid the temptation to make outrageous charges. That's his basis for calling Sebelius's statement "outrageous" and awarding it three Pinocchios. The debate is fierce and we people should avoid outrageous charges, therefore any strong characterization of a plan to reduce Medicare is false. This, too, is Washington consensus thought in its essence. The premise is that we need calm, bipartisan discourse, and the greatest impediment is people in either party saying mean things about each other. Thus they proceed straight from this assumption to the conclusion that any mean claim is false. This assumes out of existence the possibility that a plan to reduce entitlement spending might actually have dire real-world consequences that can be truthfully described.